Fashion Challenge Week 2: Wrap It Up! -- What They Made! Week two is wrapped up (no pun intended) and the contestants have their dresses submitted! Boy, we are going to have some tough judging, again! These ladies keep blowing me away and are so creative! If you missed what this week's challenge is all about, check it out HERE. 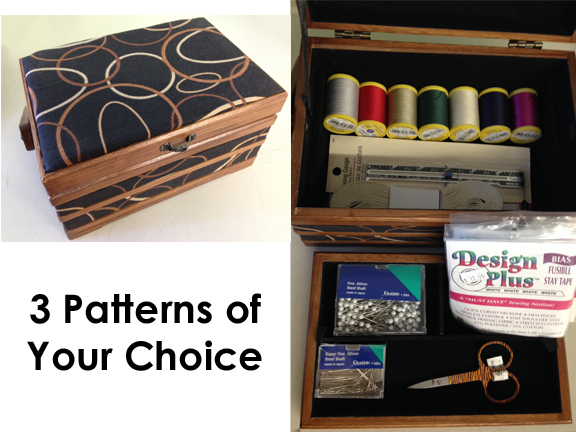 This week's guest judges are Meg Carter from McCall Pattern Co. and Linda Lee from The Sewing Workshop! Click the link above to read about them as well as the judging requirements for the challenge. This week's winner will win 3 free patterns of your choice from the McCall, Butterick, Vogue or Kwik-Sew lines AND 3 of the newest patterns released from the Sewing Workshop: Tremont Jacket, Florence Shirt and Bristol Top and Dress. VOTE NOW for your favorite dress! Reader Participation! 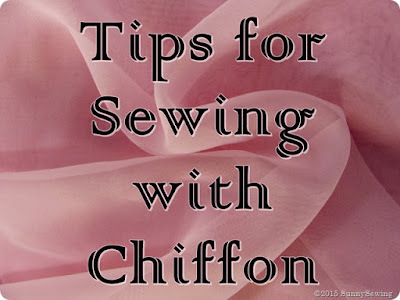 Sew along with the challenges! You have until Thursday at midnight to post a photo of your wrap dress. Use #fabricistafashionchallengereader to share a photo of your finished project on Facebook, Instagram or Twitter. 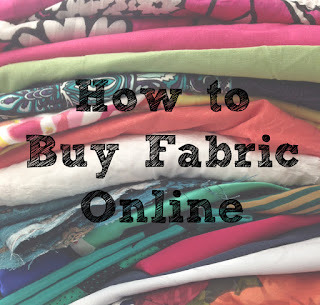 You can also email me a photo of your finished project - fabricmartblog@gmail.com. We will choose one winner at random each week to win a prize. This week's prize pack will be a copy of Successful Serging by Beth Baumgartel, a pack of 400 quilting pins (which are also suitable for garment sewing! ), and two Kwik Sew patterns - #3766 and 4081. I used Burda WOF 09/2006 #115. 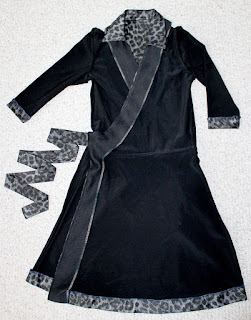 I made this pattern several years ago when I first got into sewing. This time, I made several modifications because I know how to fit my body better. Because I have a very long torso, I added an inch to the length between the shoulder and bust. I made sure this did not change the armhole or the slant of the wrap. 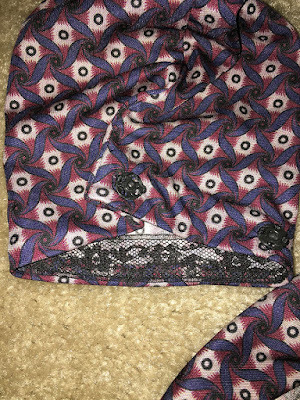 The waist seam hits me exactly where it should hit, at the waist where the fabric ties sit. I'm very happy with the bodice and how there are no wrinkles and no gaping. I added the collar because I really like that look and many of DVF wrap dresses had this. 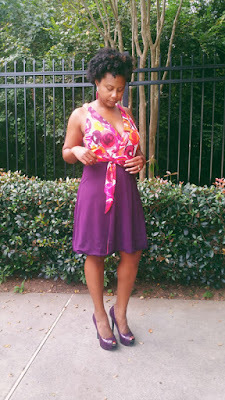 I love the collar on this wrap dress. I tried to make my creation be as much like the original as possible. Because of the collar, I could not use a self-facing like many of her dresses. Instead, I opted for a solid black one-piece facing that I drafted from the pattern pieces. It really helps give it support on the edges and makes for a beautiful finish on the inside. The facing is clipped, graded, and understitched. 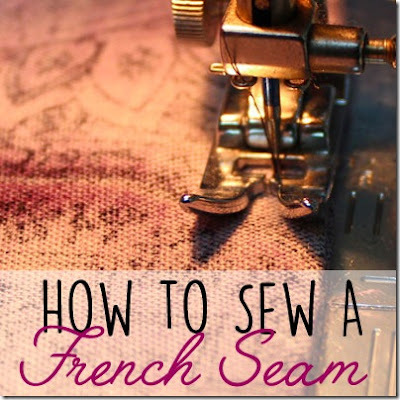 All seams are french seams to keep the inside as pretty as the outside. The hem edge is serged and then hand sewn to the skirt. 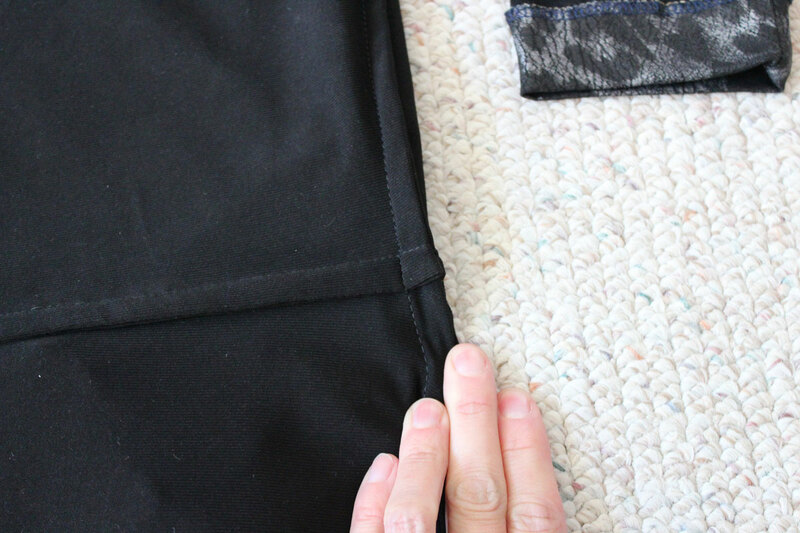 The sleeves hems are done the same way. This dress most closely resembles the Irina DVF wrap dress. The slight a-line shape and collar are what drew me to this silhouette. Because of the facing, the wrap attachment stitches are concealed and the inside is as nice as the outside. The fabric is an interesting knit. 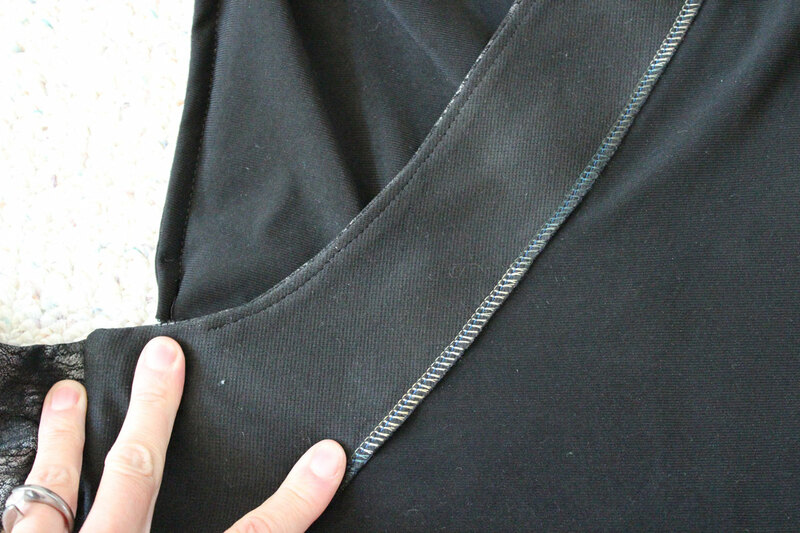 The base is a black polyester/Spandex knit. Then there is a a crinkled silver/black leopard print on top of that. I think it's perfect for this dress. Diane Von Furstenberg has a thing for animal prints and so do I. These are the dresses that inspired me to make my version. I even created my own Diane Von Furstenburg-esque photo inspired by all her leggy photos. This was a great challenge and I really liked the opportunity to go back and make this pattern fit me exactly. Over the years, I've really figured out how to modify patterns to fit me. I absolutely LOVE this dress. The DVF Dress like Chanel’s Little Black Dress at this time needs no inspiration! 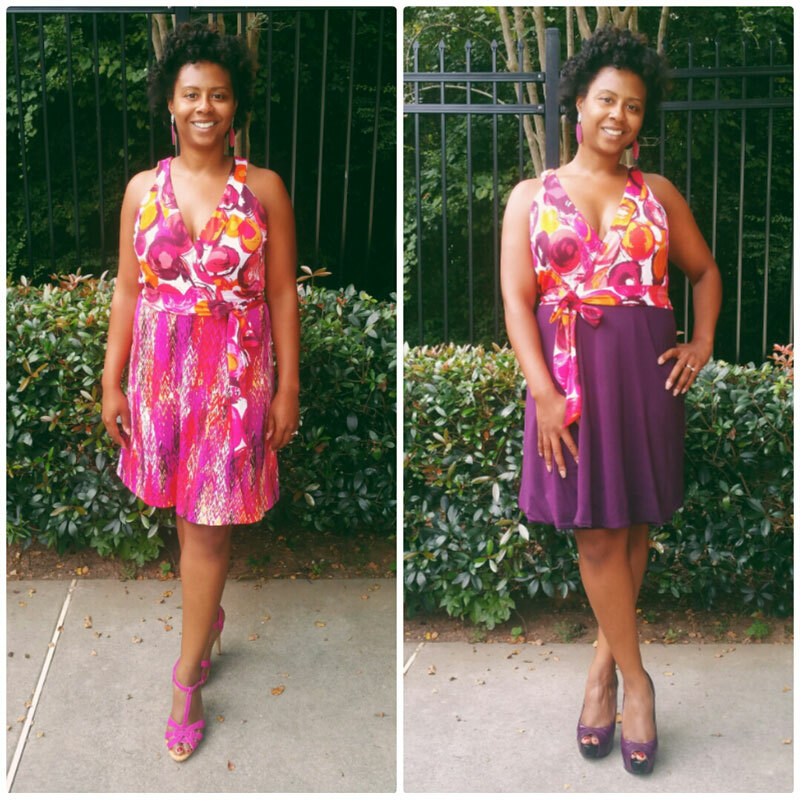 Both of these classic dresses create an attraction to just about any body size and shape! 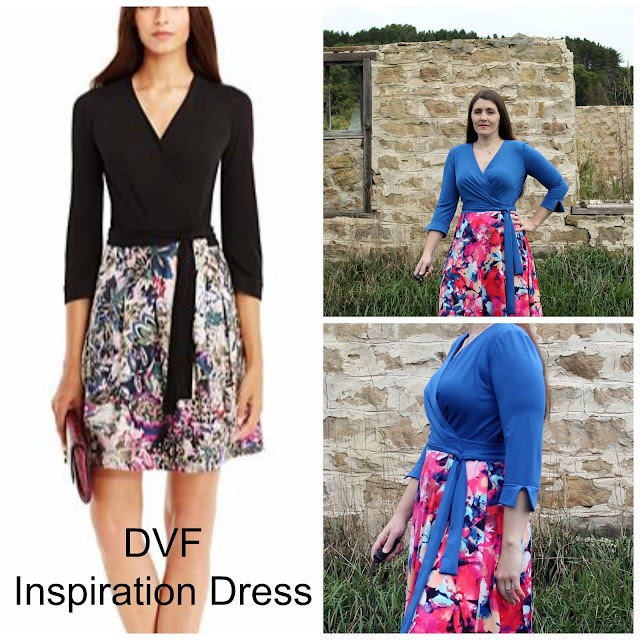 The DVF wrap dresses slenderizes where it needs to and brings a positive attention to the upper part of the body. 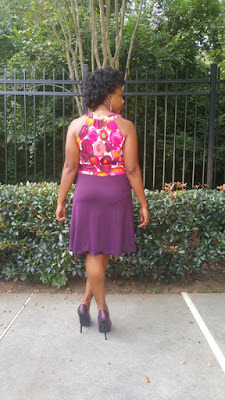 The crossover bodice also gives a nice waistline especially when using the same fabric as the bodice for the waistband. 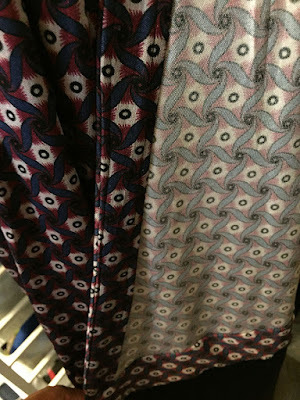 Both fabrics are a silk jersey – the top print obtained from Metro Textiles and the bottom from one of Mood Fabrics specials. Craftsmanship – While there is not much “creation” to the wrap dress there are some certain processes so there are no accidental spillages! I used McCalls 7185 the top of view D and extended it to long sleeves. I cut a 14 on the top using the cup D pattern pieces. 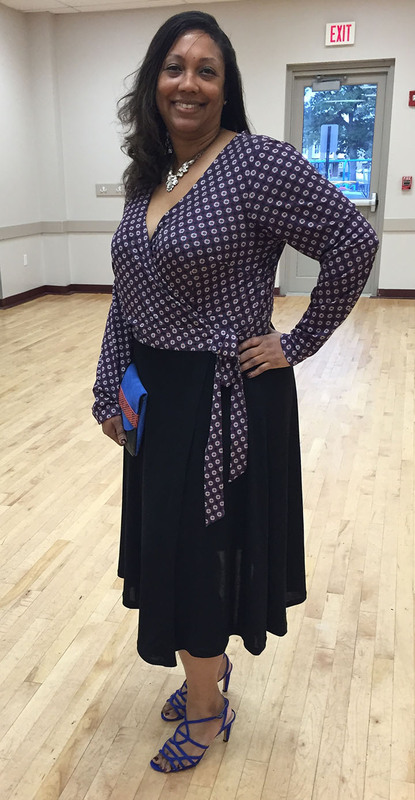 I did not care for the full gathered bottom skirt so I used the bottom of Butterick 6030, which had no darts in the waist, just a bias cut skirt. I cut a 14 on this as well but it did turn out to be too big although I did create a self-facing for the front wrap. I wind up cutting it down two inches on each side and I think that is only because it’s a silk jersey cut on the bias. I created a small self-folded facing for the front wrap piece just to give it a neater look and I had stitched it down as well as hand stitched the hem which equaled to about 78 inches around! This fabric was very temperamental and a bit difficult to handle as it slid all over the place constantly! The top had a self-facing as well, under stitched and I slipstitched it to secure it down. I also added snaps to the bottom of sleeve in case I wanted to wear it more tapered. I also added snaps to the inside to keep the right side closed when it is tied. The sleeves are set-in and there are front darts and back darts in the bodice. Fit – YES! I love this fit! I swayed away from wrap dresses for a while because they would “flap” open! 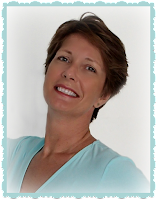 Why because I was not too familiar with a FBA (Full-Bust adjustment) and I would always cut it bigger to “fit” Now that I found a D cup pattern there is no longer this issue! The fit is perfect, the bodice grades down to the waist and the front and back darts assist with slimming the waist to a perfect closure! 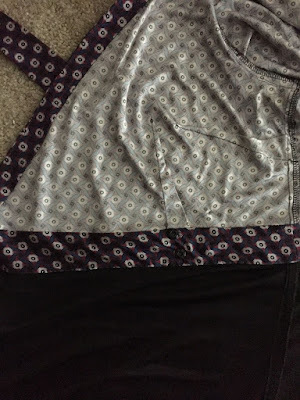 I did make my skirt about two inches long in cocktail/midi length as that is the length I prefer for mostly all my skirts. I have one more wrap planned but the next will be a print bottom and a solid top and a maxi length. There is so much inspiration to be drawn from the DVF website, I especially loved looking at her runway looks. 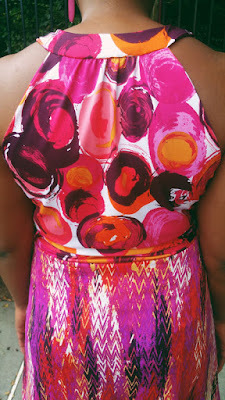 My inspiration for this dress was drawn from three of my favorite DVF dresses. The first one being her Wool and Lace Wrap Dress. The back on this dress is stunning. Although I love this look it would be impractical for me to try to wear an open back lace dress- I'm thinking along the lines of what is work appropriate. So I decided to line mine with swimwear lining. I love the way this bodice highlights the small of the waist. The second dress that caught my eye was the Linda Wool Wrap dress. The DVF version is cashmere- swoon- and I love the cozy look of it, perfect for fall, not to mention the beautiful shade of gray. 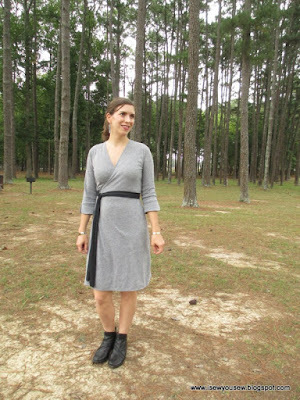 Although I don't have cashmere knit factored into my sewing budget I can get a similar look with a gray heavier weight knit. 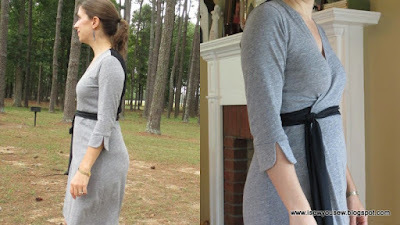 The last dress that inspired my look was the China Short Wool Wrap dress, I loved the cuff treatment on this dress and just had to have cuffs like this on my version. A lot of the inspiration I wanted to mimic was in the small details of the dresses. I made quite a few of pattern changes to get my look. 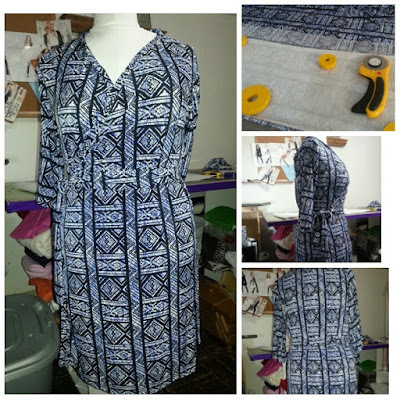 I started with the Style Arc Kate Dress and used the front panel with no gathers for both sides of the front eliminating the gathered look. 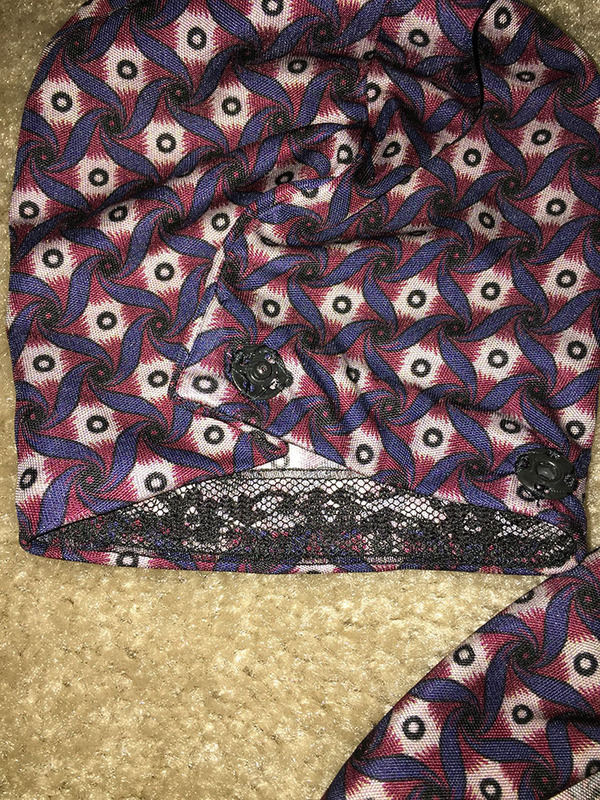 I also slashed the pattern at the waist where the side tie would come through the dress so as to align the split back with the finished ties. After slashing the dress I simply added seam allowances at both slashed edges. For the sleeves I folded the sleeve up to be a 3/4 length sleeve and drafted a cuff with curved edges. 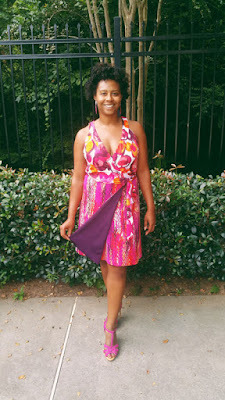 I also added a lot of length to the ties pinning and cutting them as I sewed the dress. And lastly took about three inches off the bottom of the dress. 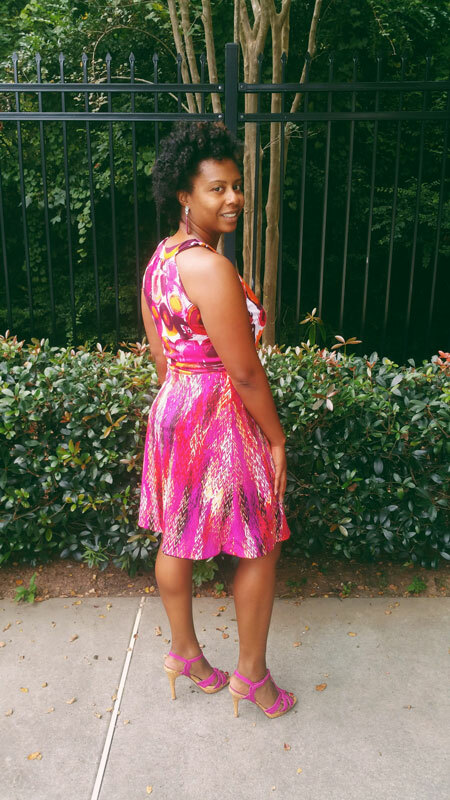 I've made this dress before so I knew the fit would be pretty forgiving and close to perfect. I added a smidge of width to the back hip area to make a little room for my bum. I really wanted the ties and edge of the black back lace contrast to hit at the smallest point of my waist so positioning the ties and slash of the dress back were important to get right. I also pinned down the ties and the cuffs to the sleeves to get the positioning of those right as well. I ended up shaving 3/8 inch off the length of my sleeves. 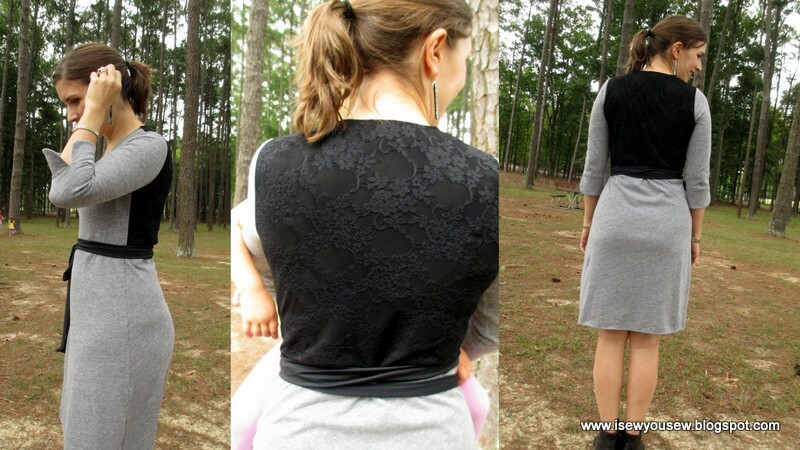 As far as construction goes, I really want to encourage anyone out there wondering if they can make a dress like this on their regular machine that indeed it can be done! 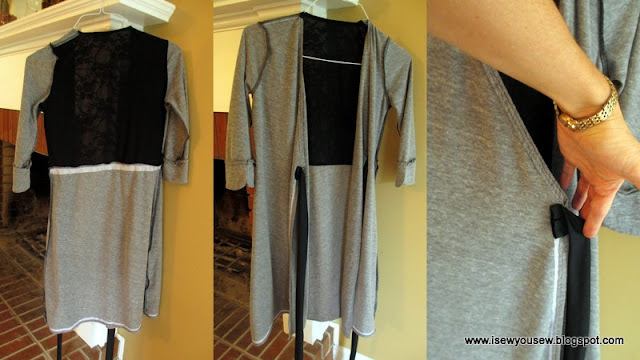 As I went along I basted and zig-zag stitched everything together before serging so as to check the fit and to make sure everything would lay down nicely, but I've made a knit wrap dress entirely with a zig-zag stitch in the past. 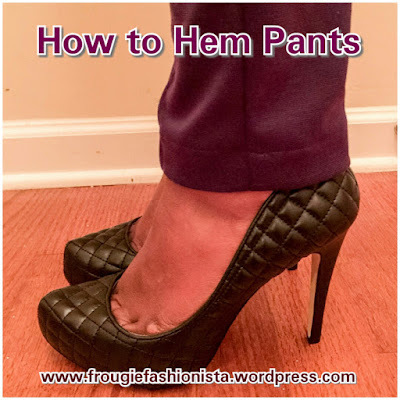 The trick is in knowing how to stabilize your seams. 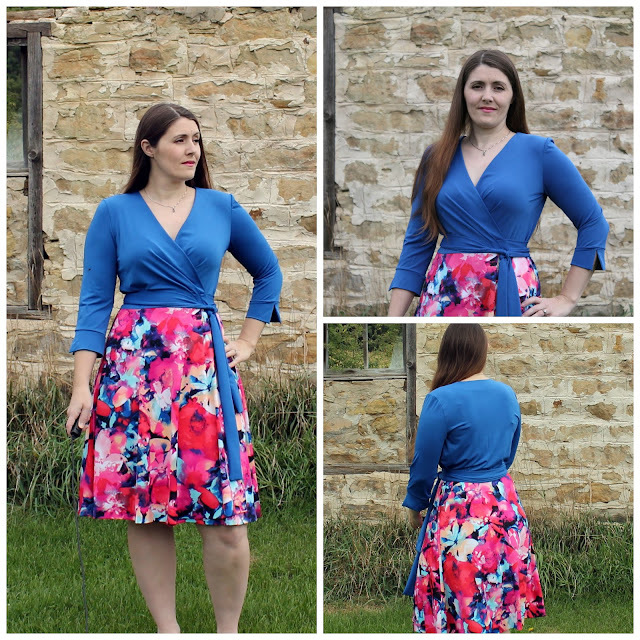 I used 3/8 wide clear elastic around the neckline of this dress- which worked perfectly since this pattern has 3/8 inch seam allowances. I did not draft facings for this pattern since I've found that facings sometimes backfire and want to flip all over the place- poo on that, who wants a flippin' facing lol! 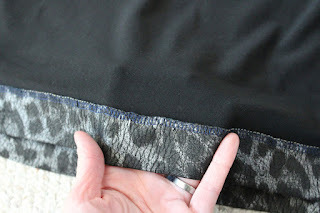 I used 1 inch wide strips of fusible tricot interfacing around the hem, front hems of the front panels and at the back waist where I joined the black lace bodice to the skirt. In sewing the back contrast bodice I used swimwear lining not only to line the lace but it also served to stabilize the lace. I basted the two together before attaching them to the back skirt portion. 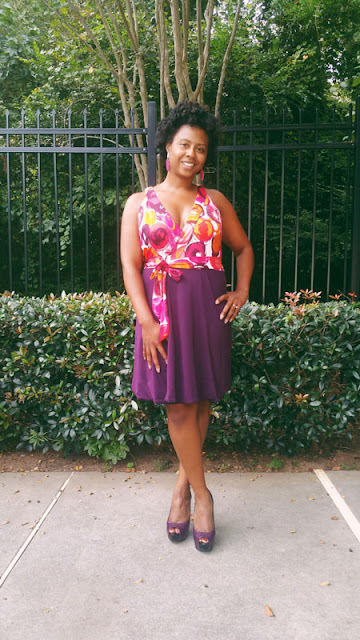 This dress is a great place to start if anyone is interested in knocking off designer looks. 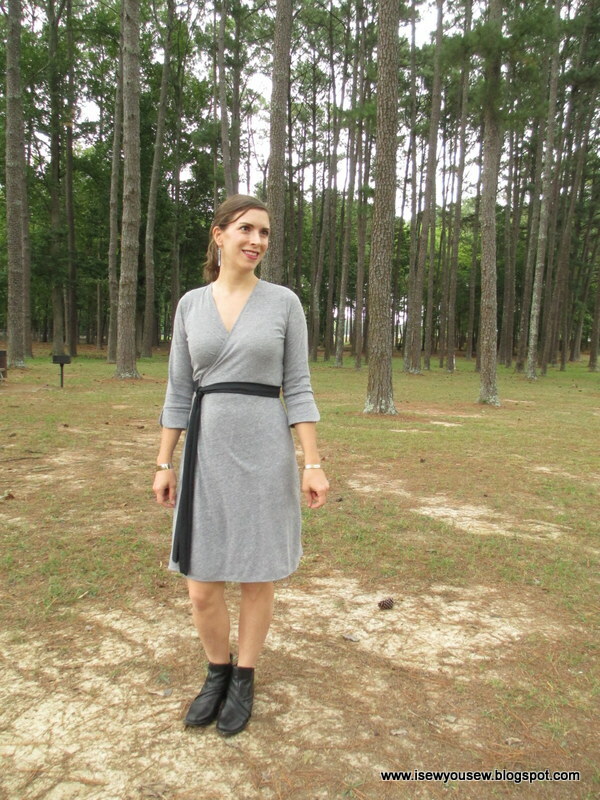 Knit wrap dresses are incredibly forgiving and extremely easy to construct. And knocking off some of the small details is very doable. I know I will get a ton of wear out of this dress and am so glad I've been able to participate in this round of the Fabricista challenge. Diane Von Furstenberg is a strong woman who overcame many obstacles to become a self-made success. She is such an inspiration to all women. Her wrap dresses are well known and loved. This challenge was difficult for me because it was so hard to pick which era I wanted to go with for an inspiration dress! In the end I choose to make my dress inspired by her recent line. For my pattern, I chose Vogue 8379 and made some minor adjustments for my body type. I’ll be honest, I’ve never made a wrap dress and never worn one either. However, the pattern instructions are great and walk you through each step with helpful pictures. I made a test dress first, it fit well and only minor tweaking was needed so I moved on to the final dress. I love that there is an opening in the bottom of the bodice on the right side to allow one of the straps to go through when wrapping around. I used my serger for most of the seams, only using the regular sewing machine to baste when instructed. I was inspired by the current line of DVF dresses because I love a great color blocked outfit. Sometimes dresses look awkward on my body (due to my pear shape) so the solid on top with print on the bottom helps keep a separation between my top and bottom halves. I wanted to keep the iconic ¾ length sleeves with the flared cuffs but left off the collar to keep it more modern looking. I blind stitched the hem by hand and tacked down the facing on both the bodice and skirt in selective places to keep them from flipping out. I disliked the idea of a center back seam on the skirt, but understood after cutting my material that this is the only way to save on fabric. 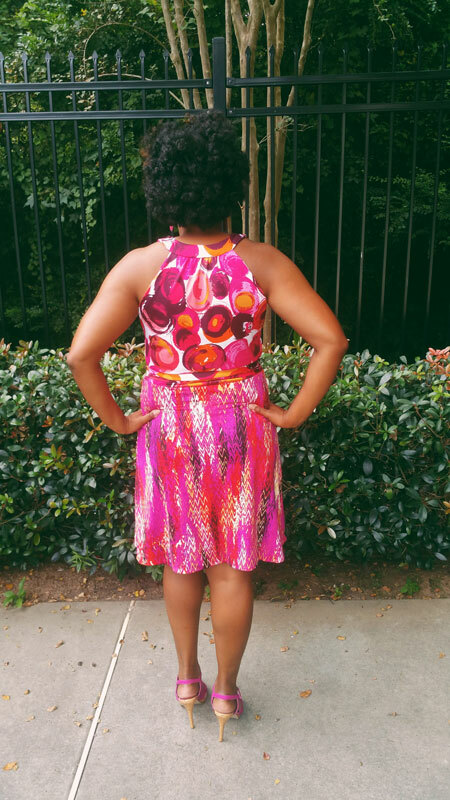 I was very careful to match the print on the center back seam to try and hide the fact that a seam is there. 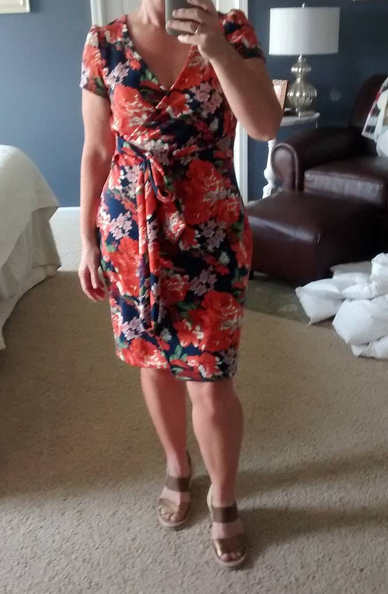 I’m very pleased with my dress and happy to have made something out of my comfort zone that I’ll actually wear. I’ve got to start by saying I’m ‘sew’ excited to be here for the second challenge because I love wrap dresses. After searching through the dvf.com website and doing a Google image search for “Diane Von Furstenberg Wrap Dress” I was actually overwhelmed with inspiration. Ultimately I selected the two dresses that inspired me the most while I was searching. This gorgeous B&W mixed print A-line wrap dress from Color Me Courtney’s Fashion blog and this flirty halter wrap dress from DVF.com. I was inspired to blend elements from these two DVF dresses, the juxtaposition of two bold prints like the first dress and the halter neckline of the second. 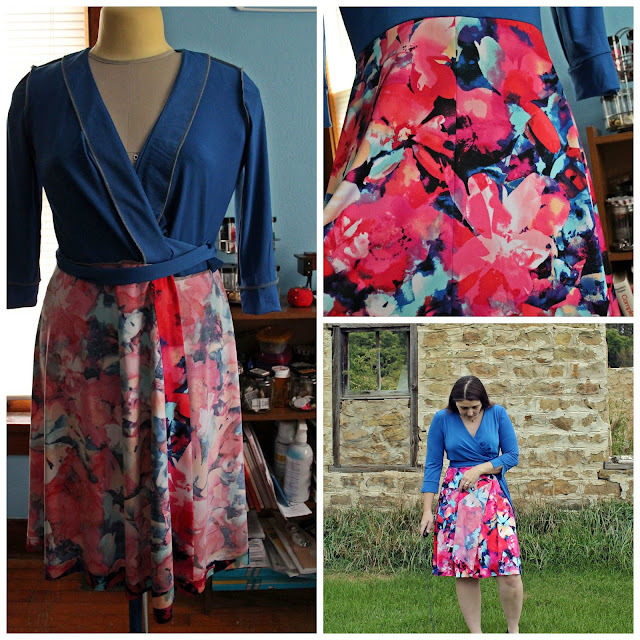 I knew I needed a wrap dress pattern with separate bodice and skirt pieces that was also a halter dress. 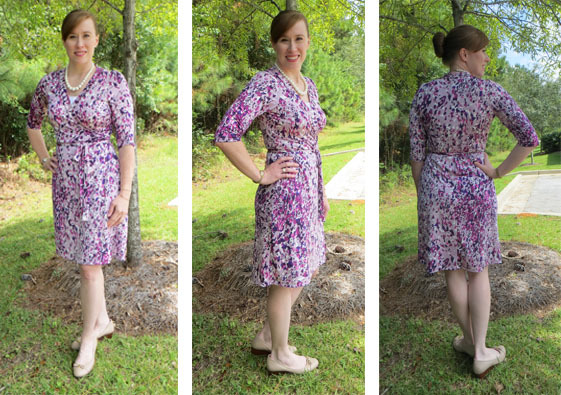 I have several wrap dress patterns but the only pattern in my stash that had a halter-ish neckline was M7119, which was great because it was on my summer to sew list but I never got to it. I could have left it at that but I also really liked the mix of the solid bodice and printed skirt of the halter inspiration dress. Suddenly it hit me that I could have both a mix of two prints and a solid/pattern pairing if I made the dress reversible! So that was the game plan. My mind immediately went to black and white prints, but I didn’t want to make a replica of either dress and my entry last week was black and white. Instead I picked these two bold ITY prints, a multi colored chevron and a large scale circle pattern, which shared the same colorway of white, pinks, orange and purples. Thankfully M7119 was not too difficult to adapt to make it fully reversible. I cut out the pattern pieces as called for but cut an extra piece (or set of pieces) for the bodice front, bodice back, skirt front and skirt back. My original plan was to use the two prints for one side and a solid bodice and printed skirt for the other side just like the halter inspiration dress. Unfortunately, I didn’t have enough of either print for the skirt of the second side. I had to change up my plan and decided to keep the same print for the bodice on both sides and add this eggplant ITY for the skirt. 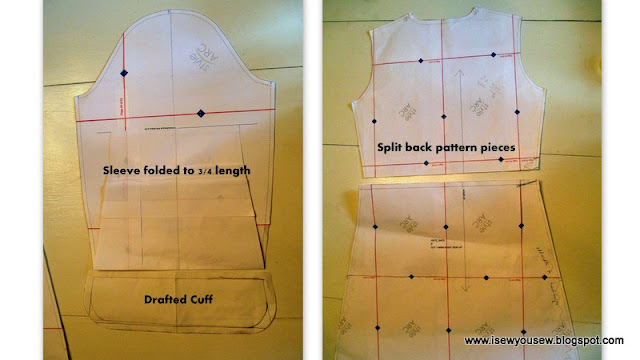 I followed the pattern directions for the bodice construction though I did it twice for the inner and outer bodice. Then sewed the inner and outer bodice pieces together at the armholes so I could work with it as one fabric. 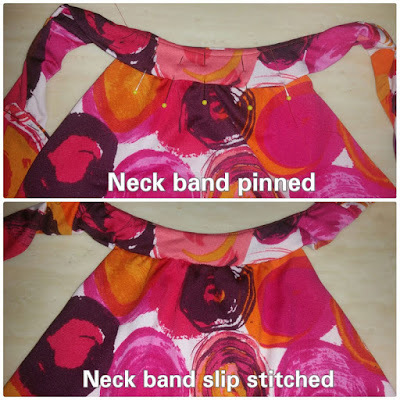 I sewed the tied ends together and attached them to the front bands. I skipped the interfacing for the front and back bands but attached them to the bodice as per the pattern instructions. Slip stitching was necessary to keep the construction as clean on the inside as the outside. Next I constructed both the inner and outer skirt as instructed except I attached the skirt pieces first at the hem and then the sides with front sides facing. This gave me clean seams on both sides of the skirt. The final step was to attach to skirt to the bodice, which was a little tricky for me but I figured it out. I placed the bodice right side out inside of the skirt piece right side in and sewed around in a skirt leaving about a 2” hole so that I could turn the dress right side out. 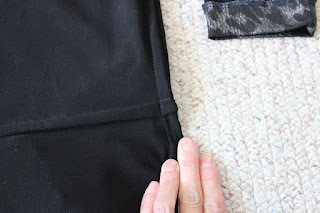 The last step was to slip stitch the hole so it was unnoticeable from the outside. Here is it! My first fully reversible piece and my first true wrap dress. I hope you love it as much as I do.